The history of fire buckets is intertwined with the history of firefighting, and mankind’s historical relationship with – leather, metal and plastic. Putting out a fire didn’t used to be as simple as dialing 999. Before about the 17th century there was very little in the way of an organised fire service anywhere in the world. Needless to say, this lead to a number of devastating fires engulfing many of the world’s major cities. London suffered great fires in 798, 982, 989, 1212 and the infamous fire in 1666. Originally started at a bakery on Pudding Lane, the fire quickly tore through two square miles of the city and destroyed thousands of buildings including the Royal Exchange, the Guildhall and the medieval St Paul’s Cathedral. Back in those days, fires were fought by parish groups using fire buckets, axes and simple water squirts stored in the local church. This leather fire bucket was found close to Pudding Lane and was probably dropped in the chaos of the fire. Made from leather with a rope handle, the buckets only held a small amount of water and some of that water was spilt as the buckets were passed from hand to hand along a line of people towards the fire. It was after the Great Fire of London that insurance companies started to form organised fire brigades. But initially at least, these were private fire brigades and were instructed only to extinguish fires on properties that were insured by the insurance company. Eventually these brigades started putting out other insurance company’s fires (for a fee to be charged later) and then started extinguishing all fires to stop fires spreading to insured buildings. Technological advancements like fire engines and sophisticated pumping systems made firefighting easier and publicly funded fire brigades followed closely behind. But the humble fire bucket still had an important role to play. As metal became easier to mine and manipulate, metal fire buckets became the next obvious jump from leather fire buckets. Instead of being stored in a church hall – and used as to combat fires wholesale, these metal buckets were stored close to where fires could start and used as a cheap and easy first line of defence against small blazes. They hung on stands in prominent positions, like in rooms and corridors, close to fire pits and in government buildings like school canteens and army barracks. They were coloured bright red to be seen and have the word fire stencilled on them. 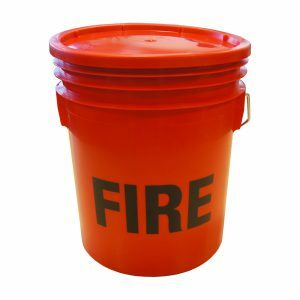 Why do fire bucket have round bottoms? Many metal fire buckets have round or conical bottoms to stop them from being stolen or used for another purpose beside fighting fires. When in use, the buckets were normally hung up or suspended by frames so that they don’t fall over. 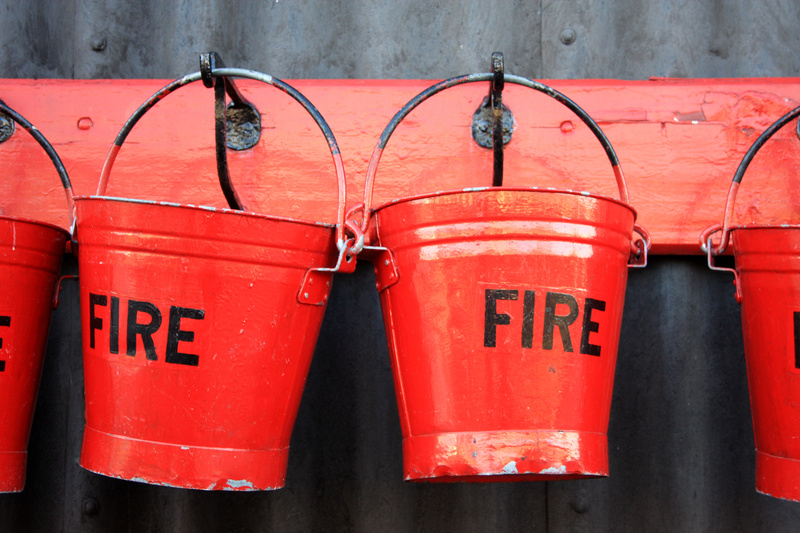 Many modern fire buckets that don’t have rounded bottoms have now become antiques. Plastic fire buckets are the modern answer to the fire bucket. Just as more and more of our products have been made from plastic – plastic buckets have become the option of choice for combatting small fires. Plastic fire buckets are cheaper than metal ones, they are lighter and easier to use. Plastic buckets are also less liable to dent and rust, as metal ones tend to do when they are left outside for long periods of time.